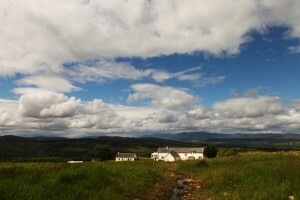 Courses at Moniack Mhor provide an atmosphere for you to fully immerse yourself in your writing. The centre is your home for the duration, free from distractions and where you will find yourself part of a nurturing writing community. Residential courses run with up to fourteen writers and each is tutored by two established, experienced tutors. Evenings are spent in the company of the group. Normally, tutors read on a Tuesday evening and a guest reader visits on Wednesday. On Friday the week culminates with the fire on in the straw bale studio sharing what you have created through the week in an informal ceilidh event. Food is included in the course price. You will find the kitchen well stocked; we cater for dietary restrictions and we can get additional items if requested. Moniack Mhor staff will welcome you with a meal on the first night and once during your stay, you will be part of a cooking team, preparing a meal for your fellow writers. You can help yourself to breakfast and lunch is served buffet style. Alcohol is available. On some courses, tutors will read a sample of your work ahead of time to provide more in-depth feedback on your work.